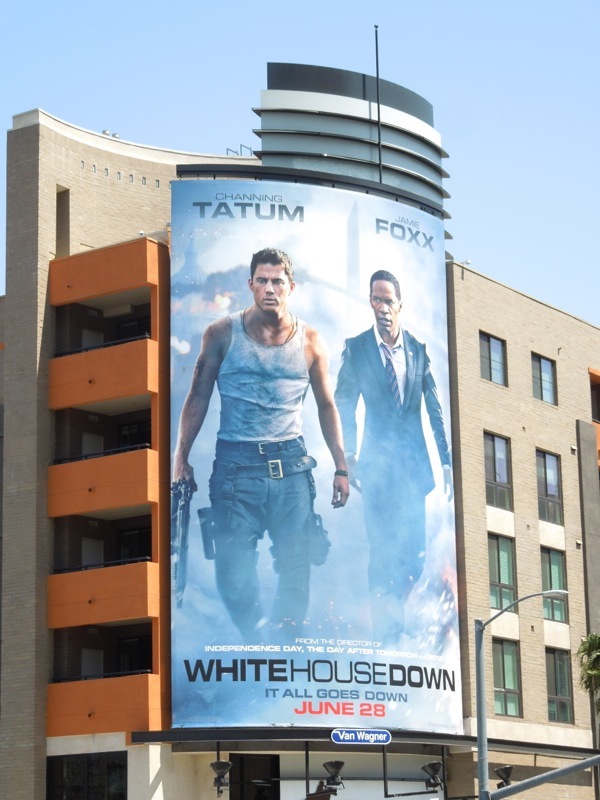 Earlier this year Olympus Has Fallen had first crack at laying siege to the White House, now it's time for Channing Tatum to try his hand at rescuing Jamie Foxx's U.S. President from a Washington D.C. terrorist attack in his best 'John McClane' vest. 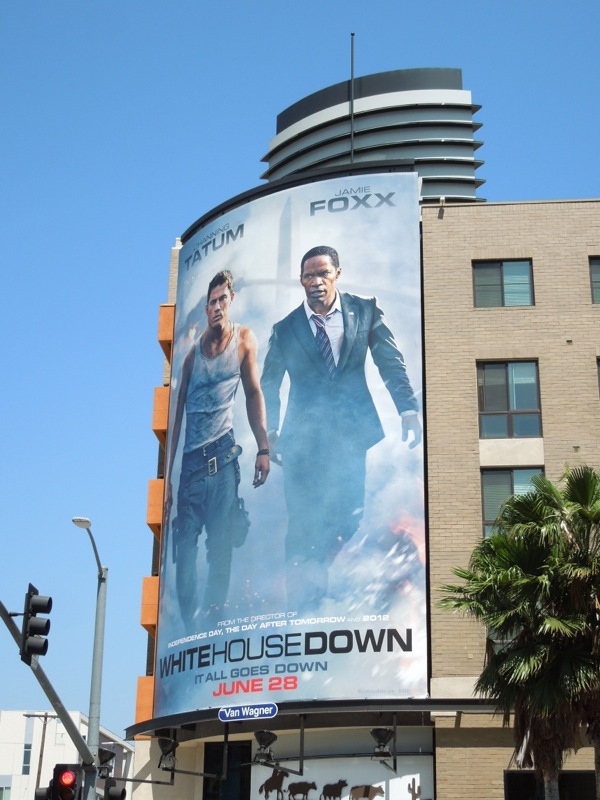 Can director Roland Emmerich (who's well known for destroying iconic national landmarks) blow up the box office this Summer and annihilate the former film's $30 million opening weekend (and current $98 million domestic gross)? 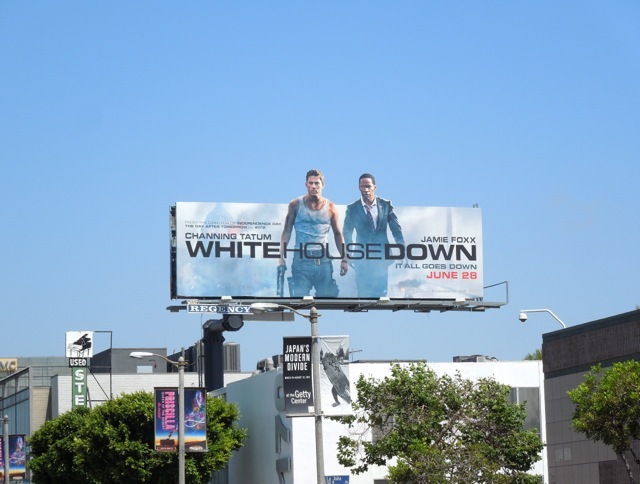 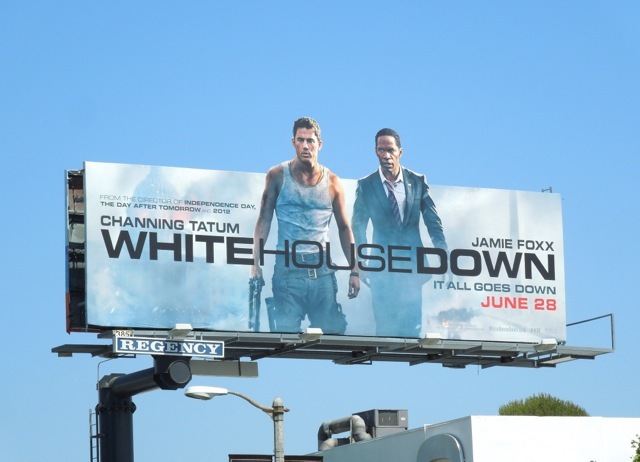 The cool special extension action hero billboard for White House Down was spied along Beverly Boulevard on June 5, whilst the large portrait version was spied along Highland Avenue and the standard landscape creative high over Sunset & Vine on June 8, 2013. 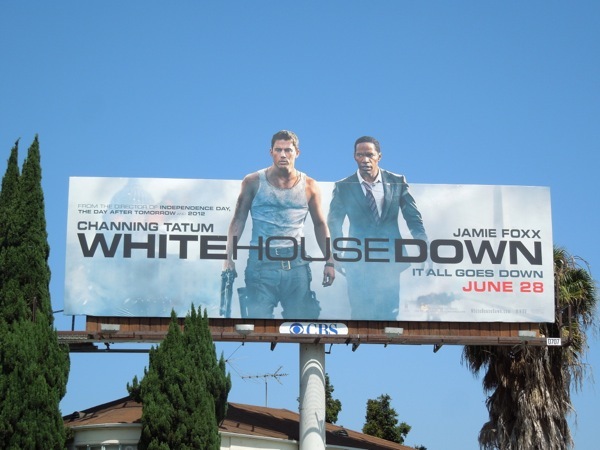 Be sure to compare these ads to the movie billboards for Olympus Has Fallen and let us know which creatives you prefer. 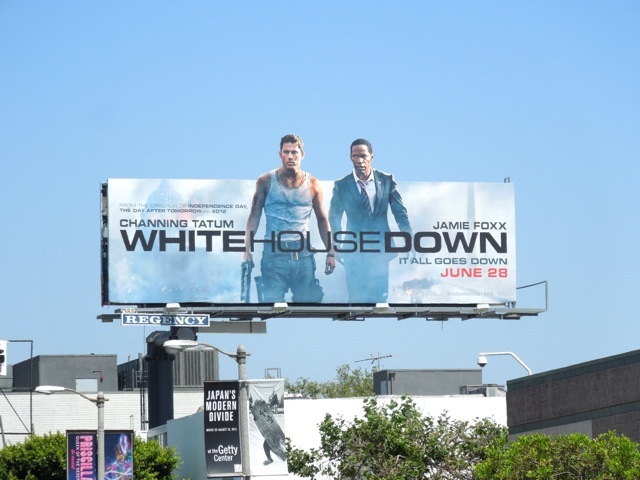 In the meantime, if you're a fan of the hunky actor (and new father) be sure to click through to some of Channing Tatum's recent movie billboards and if you're a Jamie Foxx admirer, enjoy this Django Unchained movie billboard. 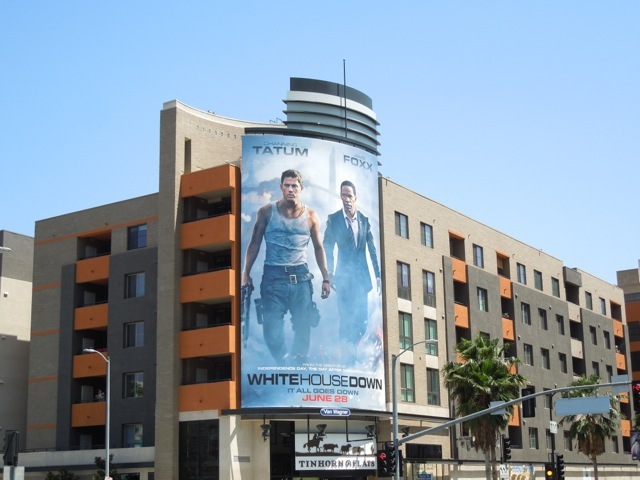 UPDATED: Here's another look at the special extension creative snapped along La Cienega Boulevard on June 16, 2013. 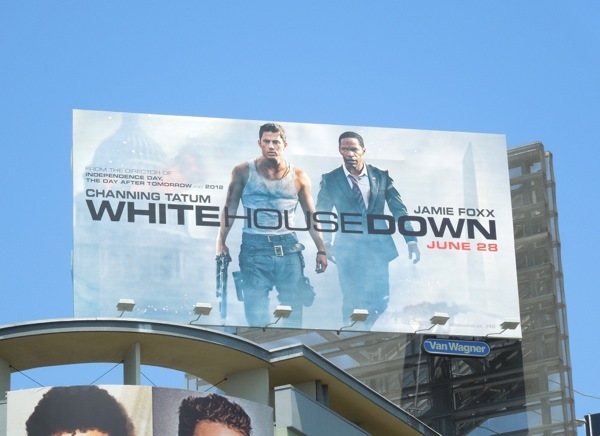 Plus be sure to also check out these original costumes worn by Channing Tatum and Jamie Foxx in White House Down on display.